Mindjet software visually captures ideas, organizes information, and creates plans so teams can work together and implement projects. Capabilities include information mapping, file management and sharing, and integrated task management. Users can brainstorm and collaborate in real-time by sharing tasks, resources, and deadlines to ensure projects are completed on time. Users can also add hyperlinks, attachments, notes, and images to develop context and clarity. Mindjet can be used on Windows and Mac desktops, the web, mobile devices (iPad, iPhone, and Android) and on-premise (when used with our on-premise server for SharePoint). Mindjet web offers information mapping, file management and sharing, and integrated task management capabilities. Browser-based functionality enables creation and management of both cloud and on-premise files (on-premise server for SharePoint required). Mindjet web includes file storing and sharing, information mapping, and social task management. When used with the Mindjet on-premise server, it also offers map creation and editing functionality integrated with SharePoint’s file management capabilities. Mindjet web is integrated with our mobile apps, so users can store and share maps from anywhere. Mindjet for Windows provides a visual framework that allows individuals and organisations to easily capture ideas, organise information, and then share work with other team members so they can quickly get clarity and consensus on problems and opportunities. Users can outline and share plans online, assign tasks to teammates and track everything in real-time using Mindjet for Windows with the Mindjet web app. Mindjet MindManager is information mapping software that gives business professionals a better way to conquer information overload, brainstorm concepts, develop strategies, simplify project planning, and communicate results. MindManager maps provide an intuitive visual framework for organizing and prioritizing work. Extensive integration with Microsoft Outlook, Office, Project and SharePoint lets users take full advantage of MindManager in the context of their typical workflow. MindManager makes it easy to capture information and ideas, including tasks, hyperlinks, attachments and notes. By displaying the big picture and all the details in a single dynamic view, MindManager fosters clarity, innovative thinking and communication to improve business results. The most powerful way to visually organize and manage information, people and projects. MindManager is the ultimate tool for increasing productivity for you or your entire team. Use it to visually connect ideas and information to help you save time, solve real business problems, improve business processes, and drive innovation. 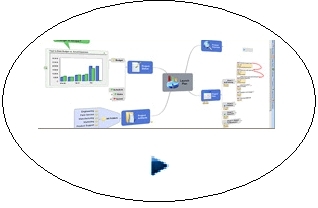 By visually organizing all your information, you’ll have the big picture clearly before you, while still tracking the smallest details.MindManager''''s graphical diagrams (mind maps) start with a central theme, then add branches with ideas, notes, images, tasks even hyperlinks and attachments. By conquering information overload, you''''ll be able to improve work processes and visually document and implement best practices throughout your organization. Bring the necessary information and ideas from colleagues, partners, customers, websites (including searches), databases, business processes and documents together to see the big picture along with the details. Visualize every aspect of your project and filter only the information you need. Mindjet wants you to be able to go to market quickly, and the MindManager tools and resources below are designed to help you do just that. Mindjet Connect is an online service that lets people with shared goals work together to get more done. In addition to online file sharing, document management, and co-editing capabilities, Mindjet Connect provides an intuitive visual framework that helps people get on the same page and stay in sync. For current MindManager 2012 customers, Mindjet Connect extends the value of mapping to your entire team or organization by providing an online service for sharing and collaborating on maps and related files. Mindjet Connect allows you to securely store and manage files online, invite anyone to contribute and collaborate without the need for additional software, and access your work anytime, from virtually anywhere, and from any device. Mindjet Connect SP is a SharePoint Solution Package and works completely within the SharePoint framework. The integration with SharePoint workflows provides a visual, company-wide Collaborative Work Management solution for Power Users (Existing MindManager users with SharePoint), Information Workers (Mindjet Connect SP users) and Information Consumers (Mindjet Connect SP Viewers). For current MindManager customers, Mindjet Connect SP extends the value of mapping to your entire team or organization by leveraging your Microsoft SharePoint integration for team collaboration. As a MindManager user you can access, create or edit any of your maps from any browser on any system through the Mindjet Connect SP web client interface. With Mindjet Connect SP, managers and their teams across the organization have a clearer understanding of goals, what''''s required to achieve those goals, and what the key next steps are. Non-MindManager users with access to SharePoint can view, edit and create new maps from within SharePoint, and all SharePoint users can consume information thru a map and benefit from seamless access to navigational and project dashboard maps imbedded in a SharePoint site free of charge. Mindjet Connect SP provides the ability to share and embed maps created in MindManager with Microsoft SharePoint users across the entire organization. IT and SharePoint administrators are always looking for ways to increase the ROI of their SharePoint investments and to increase SharePoint adoption levels by enhancing the usability of their SharePoint sites. Mindjet Connect SP leverages SharePoint processes and controls, delivering an intuitive visual interface in which users can easily find SharePoint locations, documents, and other items though an information map. Mindjet Connect SP provides a powerful SharePoint solution to discover, organize, and provide focus to any task, project, or business workflow within SharePoint and beyond. Provides the big picture, consolidating tasks and resources across SharePoint sites and lists for easy follow-up and review. Provides an interactive visual framework for capturing and organizing ideas, planning projects, and creating strategies. Reduces support issues caused by user difficulty in finding information within SharePoint. Fully leverages Microsoft infrastructure for security, compliance, governance, and business process management. Enables fast and easy deployment--install once for use on an entire server farm. Increases usage and adoption of SharePoint. Empowers employees through access to information. Enables easy sharing of Mindjet maps across the organization and gives selected users map editing rights. For Business Professionals, Mindjet MindManager Version 9 for Mac is the leading information mapping solution that lets you capture, organize, and communicate ideas and information with a single tool so you can drive more innovation, clarify thinking, develop coherent strategies, produce meaningful project plans, structure clear communications, and make better-informed decisions. Extensive integration with productivity suites like Microsoft Office Mac, Entourage, Apple iWork, iCal, and Address Book lets users take full advantage of MindManager in the context of their typical workflow. By displaying the big picture and all the details in a single dynamic view, MindManager fosters clarity, innovative thinking and communication to improve business results. The Image Pack is an Add-On and once installed, seamlessly integrates with MindManager. The seamless integration with MindManager 8, 9 and 20120 (Windows) and version 7 and 8 (Mac) means that the images are stored directly in the MindManager library where they are immediately available to you. This means that you can save time looking for suitable images outside of MindManager. With more than 300 high-resolution and graphically rich images, it''''s guaranteed to bring your MindManager maps to life. Add these bold graphics to your to-do lists, meeting agendas, project plans or any map content to add depth and highlight key information.